(Manuel Balce Ceneta | AP Photo) President Donald Trump presents the Presidential Medal of Freedom to Sen. Orrin Hatch, R-Utah during a ceremony in the East Room of the White House, in Washington, Friday, Nov. 16, 2018. 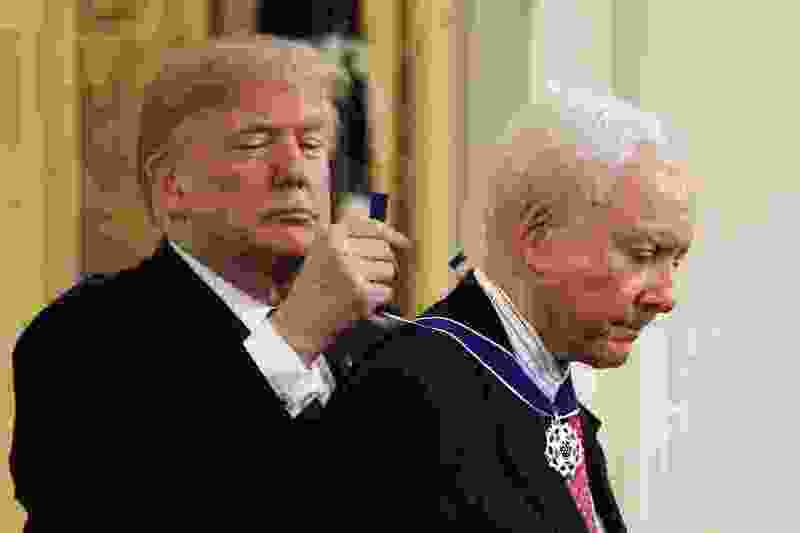 Washington • President Donald Trump on Friday bestowed the nation’s highest civilian honor on Sen. Orrin Hatch, gushing about the Utah Republican’s contributions to America during his 42 years in office. It was fair payback for Hatch, who has showered Trump with praise — arguing he could be the best president ever — and stood by Trump’s actions and provocative rhetoric as a candidate and president. The truth is, however, Hatch backed former Florida Gov. Jeb Bush and then Sen. Marco Rubio in the Republican primaries before finally supporting Trump. Since the 2016 election, the two have developed a close alliance. Hatch was one of seven awardees to earn the medal, including posthumous honors to legendary baseball star Babe Ruth, music icon Elvis Presley and the late Supreme Court Associate Justice Antonin Scalia. Trump called them all “extraordinary Americans” and saluted their service to the country in handing out the medals that presidents have awarded for some five decades to luminaries of politics, justice, arts, sports and science. Two other Utahns have been honored with the medal: movie star and philanthropist Robert Redford and the late Gordon B. Hinckley, who at the time was president of The Church of Jesus Christ of Latter-day Saints. Trump touted Hatch’s long service in office — he’s the longest-serving Republican senator in history — as the Utahn finishes out his final weeks before retirement. Trump later draped the medal around the senator’s neck as the crowd, which included several Cabinet members and Supreme Court justices, as well as Hatch’s family, applauded. Hatch later took a photo with several of the justices present — John Roberts, Ruth Bader Ginsburg, Elena Kagan, Neil Gorsuch, Samuel Alito and Brett Kavanaugh. He had participated in all of their confirmation hearings. Rep. John Curtis, R-Utah, said the award was well-deserved for Hatch. House Speaker Paul Ryan, R-Wis., also weighed in on Twitter, praising the senator. “So wonderful to see @senorrinhatch presented with the Medal of Freedom in recognition of his many years of diligent service to the people of Utah and Americans everywhere,” Ryan wrote.